ROME (CNS) — Lent is a time to receive God’s breath of life, a breath that saves humanity from suffocating under the weight of selfishness, indifference and piety devoid of sincerity, Pope Francis said. “Lent is the time to say no to the asphyxia born of relationships that exclude, that try to find God while avoiding the wounds of Christ present in the wounds of his brothers and sisters,” the pope said March 1 during an Ash Wednesday Mass. Pope Francis celebrated the Mass after making the traditional Ash Wednesday procession from the Benedictine monastery of St. Anselm to the Dominican-run Basilica of Santa Sabina on Rome’s Aventine Hill. 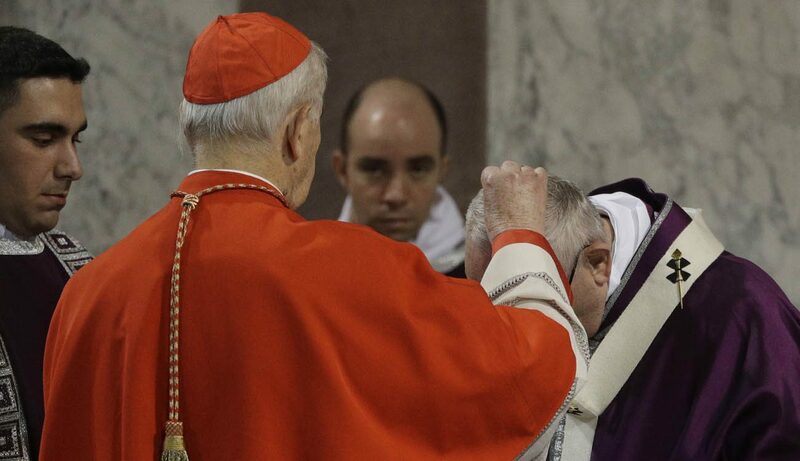 After receiving ashes on top of his head from Cardinal Jozef Tomko, titular cardinal of the basilica, the pope distributed ashes to the cardinals, his closest aides, some Benedictines and Dominicans. He also distributed ashes to a family and to two members of the Pontifical Academy for Martyrs, which promotes the traditional Lenten “station church” pilgrimage in Rome. “The breath of God’s life sets us free from the asphyxia that so often we fail to notice or become so used to that it seems normal, even when its effects are felt,” the pope said. The Lenten season, he continued, is a “time for saying no” to the asphyxia caused by superficial and simplistic analyses that “fail to grasp the complexity of problems” of those who suffer most. “Lent is the time to say no to the asphyxia of a prayer that soothes our conscience, of an almsgiving that leaves us self-satisfied, of a fasting that makes us feel good,” the pope said. “Lent is the time to start breathing again. It is the time to open our hearts to the breath of the One capable of turning our dust into humanity,” the pope said.